This page shows the daily distribution and the methods of acquisition of free Orbs. The maximum amount of obtainable Orbs from Quests, Arena and Tempest Trials rewards is shown. It is assumed that Daily Orbs from attendance events like the Six-Month Anniversary event, were acquired in the first 10 days of the event. Story Maps: [Mar 8] A Father's Legacy. Paralogue maps: [Mar 19] Regal Rabbits. Chain Challenge: [Mar 19] Paralogue 31 & 32. Squad Assault: [Mar 7] Squad Assault 20. Special Maps: [Mar 2] Rival Domains: Event Map (48), [Mar 9] Rival Domains: Event Map (49), [Mar 16] Rival Domains: Event Map (50), [Mar 23] Rival Domains: Event Map (51), [Mar 26] Bartre & Fir: Bound Hero Battle, [Mar 29] Yune: Chaos Goddess (map), [Mar 30] Rival Domains: Event Map (52). Grand Conquests: [Mar 14] Grand Conquests 13. Quests: [Mar 1] Monthly Quests, [Mar 2, 3, 9, 10, 16, 17, 23, 24, 30, 31] Daily Quests, [Mar 2, 4] Voting Gauntlet: War of the Tacticians, [Mar 3] Weapon Workout, [Mar 5] Bound Hero Battle: Micaiah & Sothe, [Mar 8] A Father's Legacy, [Mar 14, 16, 18] Grand Conquests 13, [Mar 16] Movement Type [Mar 19] Regal Rabbits, [Mar 20] Bound Hero Battle: Ishtar & Reinhardt. Log-In: [Mar 1] Kitsune and Wolfskin Log-In Bonus, [Mar 1-6] Voting Gauntlet: War of the Tacticians Log-In Bonus, [Mar 3, 10, 17, 24, 31] Daily Log-In Bonus on Sunday, [Mar 8-17] Beyond Darkness Log-In Bonus, [Mar 19-28] Regal Rabbits Log-In Bonus, [Mar 21-30] Tempest Trials+: To Defy the Gods Log-In Bonus, [Mar 28] Voting Gauntlet...Coming Soon (Destructive Forces) (Notification). Story Maps: [Feb 20] Book III, Chapter 4: A King's Worth. Paralogue maps: [Feb 8] Paralogue 31: Greil's Devoted. Tactics Drills: Grandmaster 24: Armored Alliance. Chain Challenge: [Feb 20] Book III, Chapter 3 & 4. Squad Assault: [Feb 7] Squad Assault 19. Special Maps: [Feb 2] Rival Domains: Event Map (43), Part 1: Daily (Feb 2019), [Feb 3] Part 2: Daily (Feb 2019), [Feb 4] Part 3: Daily (Feb 2019), [Feb 5] Part 4: Daily (Feb 2019), [Feb 6] Part 5: Daily (Feb 2019), [Feb 7] Part 6: Daily (Feb 2019), [Feb 8] Part 7: Daily (Feb 2019), [Feb 9] Rival Domains: Event Map (44), Part 8: Daily (Feb 2019), [Feb 10] Part 9: Daily (Feb 2019), [Feb 11] Part 10: Daily (Feb 2019), [Feb 12] Part 11: Daily (Feb 2019), Cherche & Virion: Bound Hero Battle, [Feb 16] Rival Domains: Event Map (45), [Feb 23] Rival Domains: Event Map (46), [Feb 27] Roy: Blazing Lion (map). Arena: [Feb 6, 11, 18, 25] Arena Tier 21 rewards, [Feb 7, 12, 19, 26] Arena Chain rewards. Blessed Gardens: [Feb 3] Grounds of Fire: Fire 6, [Feb 17] Grounds of Wind: Wind 7. Tempest Trials: [Feb 10] Tempest Trials+: Greil's Request. Tap Battle: [Feb 11, 15] Illusory Dungeon: Carrying the Flame. Grand Conquests: [Feb 16] Grand Conquests 12. Forging Bonds: [Feb 20-26] Forging Bonds: The Orb Case. Quests: [Feb 1] Monthly Quests, [Feb 2, 3, 9, 10, 16, 17, 23, 24] Daily Quests, [Feb 2, 4] Voting Gauntlet: Mothers and Sons, [Feb 4] Grand Hero Battle: Walhart, [Feb 5] Pair Up, [Feb 8] Greil's Devoted, [Feb 12, 16] Illusory Dungeon: Carrying the Flame, [Feb 16, 18, 20] Grand Conquests 12, [Feb 18] Grand Hero Battle: Jamke, [Feb 20] A King's Worth, [Feb 22] Arena, [Feb 28] Voting Gauntlet: War of the Tacticians. Log-In: [Feb 1] Hostile Springs Log-In Bonus, [Feb 1-2] Tempest Trials+: Heating Things Up Log-In Bonus, [Feb 1-6] Voting Gauntlet: Mothers and Sons Log-In Bonus, [Feb 2-11] 2nd Anniversary Log-In Bonus, [Feb 3, 10, 17, 24] Daily Log-In Bonus on Sunday, [Feb 8-17] Greil's Devoted Log-In Bonus, [Feb 9-18] Tempest Trials+: Greil's Request Log-In Bonus, [Feb 20-28] Kitsune and Wolfskin Log-In Bonus, [Feb 25-28] Voting Gauntlet: War of the Tacticians Log-In Bonus. Story Maps: [Jan 11] Book III, Chapter 3: Countdown. Paralogues: [Jan 1] Paralogue 29: New Year's Wish, [Jan 23] Paralogue 30: Hostile Springs. Chain Challenge: [Jan 23] Paralogue 29 & 30. Squad Assault: [Jan 10] Squad Assault 18. Special Maps: [Jan 4] Klein & Clarine: Bound Hero Battle, [Jan 5] Rival Domains: Event Map (39), [Jan 12] Rival Domains: Event Map (40), Naesala: Sky's Shadow (map), [Jan 19] Rival Domains: Event Map (41), [Jan 26] Rival Domains: Event Map (42), [Jan 27] Elincia & Nephenee: Bound Hero Battle, [Jan 30] Duma: God of Strength (map). Arena: [Jan 7, 14, 21, 28] Arena Tier 21 rewards, [Jan 1, 8, 15, 22, 29] Arena Chain rewards. Tempest Trials: [Jan 1] Tempest Trials+: An Alliance of Princesses, [Jan 26] Tempest Trials+: Heating Things Up. Tap Battle: [Jan 15, 16, 17, 18, 20] Illusory Dungeon: Kingdom of Nohr. Grand Conquests: [Jan 18] Grand Conquests 11. Forging Bonds: [Jan 11-17] Forging Bonds: Hearts as One. Log-In: [Jan 1-8] Tempest Trials+: An Alliance of Princesses Log-In Bonus, [Jan 1-9] Voting Gauntlet: New Year's Showdown Log-In Bonus, [Jan 1-10] New Year's Log-In Bonus, [Jan 6, 13, 20, 27] Daily Log-In Bonus on Sunday, [Jan 11-20] Rulers of the Laguz Log-In Bonus, [Jan 23-31] Hostile Springs Log-In Bonus, [Jan 24-31] Tempest Trials+: Heating Things Up Log-In Bonus, [Jan 28-31] Voting Gauntlet: Mothers and Sons Log-In Bonus. Quests: [Jan 1] Monthly Quests, New Year's Wish, New Year!, [Jan 3, 5, 7] Voting Gauntlet: New Year's Showdown [Jan 5, 6, 12, 13, 19, 20, 26, 27] Daily Quests, [Jan 8] Light Blessing Quests, [Jan 11] Countdown, [Jan 14] Three Heroes Quests, [Jan 18, 19] Tap Battle, [Jan 18, 20, 22] Grand Conquests, [Jan 20] Bound Hero Battle: Leo & Elise, [Jan 23] Hostile Springs, [Jan 31] Voting Gauntlet: Mothers and Sons. Squad Assault: [Nov 08] Squad Assault 16. Special Maps: [Nov 03-09] Rival Domains: Event Map (31), [Nov 10-16] Rival Domains: Event Map (32), [Nov 16] Corrin & Kana: Bound Hero Battle, [Nov 17-23] Rival Domains: Event Map (33), [Nov 21] Nifl and Múspell, [Nov 24-30] Rival Domains: Event Map (34), [Nov 28] Hríd: Icy Blade (map). Arena: [Nov 05/12/19/26] Tier 21 Arena rewards, [Nov 06/13/20/27] Arena Chain rewards. Paralogues: [Dec 18] Winter's Envoy & [Dec 31] Happy New Year! Quests: [Dec 1] December, [Dec 2/3/9/10/16/17/23/24/30/31] Daily Quests, [Dec 6/8/10] Voting Gauntlet, [Dec 8] Grand Hero Battle, [Dec 12] Devs Say Thanks!, [Dec 18] Winter's Envoy, [Dec 20] Sharena, [Dec 23] Grand Hero Battle, [Dec 27] Three Heroes & [Dec 31] Happy New Year! Paralogues: [Oct 16] World of Holy War & [Oct 30] Trick or Defeat! Quests: [Oct 1] October, [Oct 1/7/8/14/15/21/22/28/29] Daily Quests, [Oct 3/10] AA: Chain Wins, [Oct 6] Three Heroes, [Oct 9/11/13] Voting Gauntlet, [Oct 16] World of Holy War, [Oct 26] Grand Hero Battle & [Oct 30] Trick or Defeat! Log-In: [Oct 1/8/15/22/29] Play Everyday Sunday, [Oct 1-2] Tempest Trials, [Oct 1-8] Performing Arts, [Oct 9-18] Version 1.8.0 Release, [Oct 16-25] World of Holy War, [Oct 20-29] Fire Emblem Warriors International Release, [Oct 23-31] Tempest Trials & [Oct 30-31] Trick or Defeat! This page shows the distribution and the methods of acquisition of Sacred Coins. The maximum amount of obtainable Sacred Coins from Quests, Arena Assault and Tempest Trials rewards is shown. It is assumed that Daily Sacred Coins from attendance events like the Sacred Seal Forge Support event, were acquired in the first 10 days of the event. Arena: [Mar 5, 12, 19, 26]: Arena Chain rewards. Arena Assault: [Mar 4, 11, 18, 25]: Arena Assault rank 1~1000 rewards. Tempest Trials: [Mar 23] Tempest Trials+: To Defy the Gods. Tap Battle: [Mar 10] Labyrinth of Mists. Quests: [Mar 2, 4] Voting Gauntlet: War of the Tacticians. Arena: [Feb 7, 12, 19, 26]: Arena Chain rewards. Arena Assault: [Feb 6, 11, 18, 25]: Arena Assault rank 1~1000 rewards. Quests: [Feb 2, 4] Voting Gauntlet: Mothers and Sons, [Feb 28] Voting Gauntlet: War of the Tacticians. This page shows the distribution and the methods of acquisition of Refining Stones. The maximum amount of obtainable Refining Stones from Quests, Arena and Arena Assault rewards is shown. Quests: [Mar 2, 4] Voting Gauntlet: War of the Tacticians, [Mar 23-31] Tempest Trials+: To Defy the Gods. Quests: [Feb 2, 4] Voting Gauntlet: Mothers and Sons, [Feb 28] Voting Gauntlet: War of the Tacticians, [Feb 1-4] Tempest Trials+: Heating Things Up, [Feb 10-19] Tempest Trials+: Greil's Request. Arena: [Jan 1, 8, 15, 22, 29] Arena Chain rewards. Arena Assault: [Jan 7, 14, 21, 28] Arena Assault rank 1~1000 rewards. This page shows the distribution and the methods of acquisition of free Blessings. It is assumed that Blessings from Maps, Tempest Trials and Quests were acquired on the first day of release. Blessings obtained from summoning Legendary Heroes and Mythic Heroes in Legendary and Mythic Summoning Events, are not accounted for. [Feb 3] Grounds of Fire: Fire 6. [Feb 27] Roy: Blazing Lion (map). [Feb 10] Grounds of Water: Water 7. [Feb 17] Grounds of Wind: Wind 7. [Feb 24] Grounds of Earth: Earth 7. [Feb 2] Aether Raids weekly chain rewards. [Feb 11, 16, 23] Aether Raids weekly chain rewards. [Feb 10] Tempest Trials+: Greil's Request. [Jan 27] Grounds of Earth: Earth 6. [Jan 6] Grounds of Fire: Fire 5. [Jan 9] Tempest Trials+: Heating Things Up. [Jan 13] Grounds of Water: Water 6. [Jan 20] Grounds of Wind: Wind 6. [Jan 1] Tempest Trials+: An Alliance of Princesses. [Jan 4, 11, 19, 26] Aether Raids weekly chain rewards. [Jan 30] Duma: God of Strength (map). This page shows the distribution and the methods of acquisition of Heroic Grails. 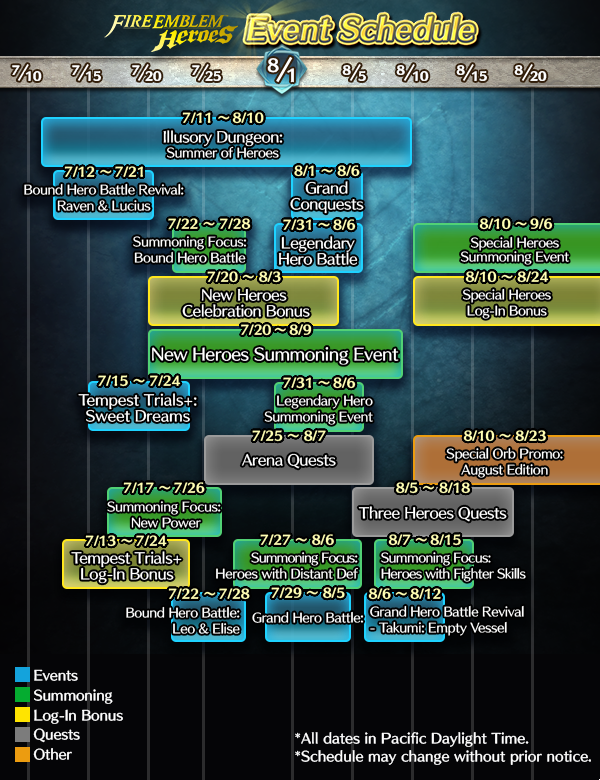 The maximum amount of obtainable Heroic Grails from Quests, Aether Raids and Forging Bonds rewards is shown. Aether Raids: [Dec 5, 13, 19, 26] Weekly chain rewards, [Dec 9, 16, 23, 30] Rank 1~3000 rewards, [Dec 9] AR Tier 18 rewards, [Dec 16] AR Tier 19 rewards, [Dec 23] AR Tier 20 rewards, [Dec 30] AR Tier 21 rewards. Aether Raids: [Nov 11, 21, 28] Weekly chain rewards, [Nov 18, 25] Rank 1~3000 rewards, [Nov 18] AR Tier 10 rewards, [Nov 25] AR Tier 14 rewards. Other: [Nov 8] Visit Use Heroic Grails menu for the first time.